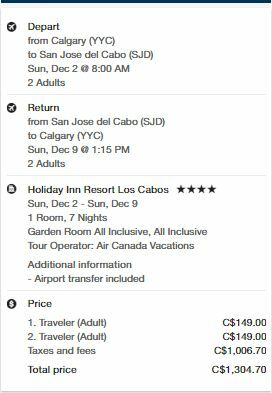 Air Canada Vacations has dropped the price of a 1 week all inclusive package (flight, hotel, transportation, all meals, all drinks) from Calgary to the 4* Holiday Inn Resort in San Jose del Cabo, Mexico down to $654 CAD (per person) including taxes. The Holiday Inn has 4 circles on TripAdvisor with 34% of reviews rating it as Excellent. The Air Canada flights from Calgary to Cabo San Lucas, Mexico included with the package are non-stop both ways. NOTE: After your Expedia search completes, use the 'Search by Hotel Name' drop down menu near the top left to find the 'Holiday Inn Resort Los Cabos'. calgary, yyc, all inclusive deals, mexico, san jose del cabo, sjd, air canada vacations, los cabos, north america and holiday inn resort. 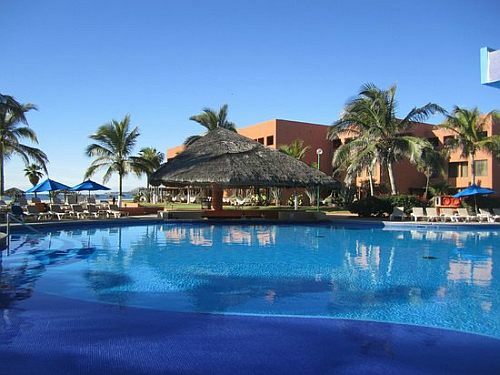 One Response to "1 Week All Inclusive Package Deal: Calgary to 4* Holiday Inn in San Jose del Cabo, Mexico - $652 CAD including taxes"
I've stayed at that resort - it was nice - not fancy, but clean and had all of the amenities. Nice location too - approximately 15 leisurely stroll to the town. The food was very good. If I recall, there was an evening buffet next to the beach each night with really fun entertainment (music, costumes, dance routine). If the kids wanted, they could run around on the beach during the show and mostly be in sight by their parents. Very family-friendly. They did give us a very half-hearted five minute pitch for a timeshare (or something like that), but didn't push it when we said we weren't interested.